Canopy cover is an important consideration in any reforestation project – it tells us how much of an area is covered by the leaves of trees. This is significant because the density of the tree canopy affects how much sunlight and rain makes it through to the plants and animals living in the understory, and thus determines what species may be found there. Justin Johnson, our planting contractor from Threshold Environmental, is currently undertaking a fascinating research project for his PhD where he hopes to be able to quantify canopy cover in our plantings. The science of plant morphology and competition is a complex one. Plants grow differently depending on how close they are to others, and what kinds of plants are nearby. This is especially the case with plants in the myrtacea family (except Eucalypts) where we can clearly observe a ‘short and stout’ versus ‘tall and narrow’ process going on – yet just as much carbon is being captured. Because of this, canopy cover is generally not a good predictor of carbon sequestration. However, it is certainly a good indicator of the overall ‘ecological value’ of a given area. Currently we measure stem densities specific to genera, such as Eucalypt, Melaleuca, Acacia and Allocasuarina, as a proxy for the ‘re-assembling plant communities’. 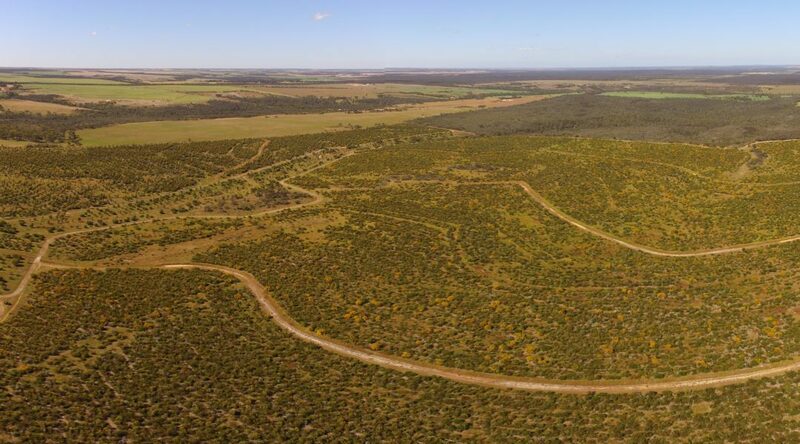 We work hard to create plantings that are consistent with the stocking densities in native plant communities, to replicate the naturally occurring bushland. With this data we can make predictions to forecast canopy cover, but when plantings are still young it is not very accurate. Making an estimate of canopy cover is a complex process – walking through a planting it often looks as though there are a lot of plants, but once you fly a drone overhead it looks much less ‘covered’. The value of measuring canopy cover in plantings less than 20 years old is also unclear. This is especially pertinent when we consider that some species such as Allocasuarina huegeliana (Rock sheoak) and Acacia acuminata (Jam) have very small canopies at less than 10 years old, but form large dense canopies when mature at around 20 years. We estimate that our plantings will achieve canopy covers equivalent to native ecosystems over the next 10 to 20 years of growth, creating huge carbon sinks that replace the bushland which once covered our beautiful country.